At first read, you find a fun novel focused primarily on a woman (Cassie) experiencing romance. Yet, there are so many layers to her story. She’s nearing forty and has yet to find someone she wants to spend forever with. It’s not as though she hasn’t had the prospects. They just never measure up to her high standards, or are able to penetrate the thick wall she’s built around herself. When a handsome man decides to encroach on the support group Cassie has formed for nearly middle-aged, single females, she gets incredibly flustered and and wants nothing to do with him. Yet, there is so much she finds interesting about this man, a man who she eventually hires on to do contract work for the company she works for. Which enables them to learn more about one another, something she enjoys, yet she’s cautious. Relationships are doomed to failure, and eventually, everyone leaves. That’s been her life’s motto. While I’m roughly the same age as Cassie, our personalities are vastly different. I’ve been happily married now for nearly seven years, and I’ve got two sons, a life choice Cassie doesn’t want. Yet, she and I share the same background where our mothers are concerned. I can totally identify with her defense mechanisms, because I at times suffer from the same fears, or what I jokingly refer to as, “mommy issues”. Cassie has a hard time getting over the broken relationship she has with her mother, and she’s not sure she can forgive. This bleeds into the other relationships she has, whether it’s romantic, or otherwise. It’s not often a book resonates so deeply with me, reflecting much of what I’ve dealt with in my own personal life. I really enjoyed Dating for Decades, finding it to be a cathartic experience. It was unsuspected, heartfelt, and left me questioning what path I want to take in my own life, where forgiveness is concerned. A few months ago, I read my first Tracy Krimmer novel, Sparing the Heart, and loved it (reviewed here). When I found out that she had a new novel coming this summer, I was excited to see what else she could write about. While the synopsis didn't really catch my eye as much, I had faith that the story within would impress me...and it definitely did! Tracy Krimmer has proven once again what a natural she is at storytelling. Her writing voice is so genuine and brings her characters to life, as if they were personal friends of mine. I could relate to Cassie because she's turning 40, likes to do everything herself for her job (even though I have more trouble delegating when it comes to my blog), and has a hard time telling people what is going on in her life or how she's feeling about it. This is more than just a story about dating and relationships. It's about career, family, and forgiveness, among other things. I won't lie...there are some hot scenes and definitely a lot of laugh-out-loud moments. There is a level of unpredictability for quite some time. However, if you've read Sparing the Heart recently, I'd wait until it's clear from your head before reading this. Some parts felt similar to "Sparing," even though the characters and circumstances were different. I felt like it followed a pattern, but since this is only the second book of Tracy's I've read, I don't know how her other books play out. Even so, this did not detract from my enjoyment and some parts still kept me guessing. There's a lot of heart to this story and I can tell Tracy put plenty of thought and love into it. It was easy to read and difficult to put down. I'm already excited to see what she comes up with next. Of course, I was casting this book as I was reading it. Thanks to Tracy Krimmer for the book in exchange for an honest review. 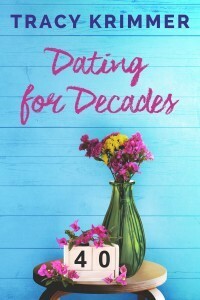 Dating for Decades is 99 cents through July 31st! And Sparing the Heart is FREE for Kindle through July 10th! Sounds really good. Thanks for the recommendation! Sparing the Heart is free on Kindle right now! I picked it up yesterday. I can't wait to read Dating for Decades. I have several of Tracy's books on my Kindle and need to get busy reading! Loved your reviews!